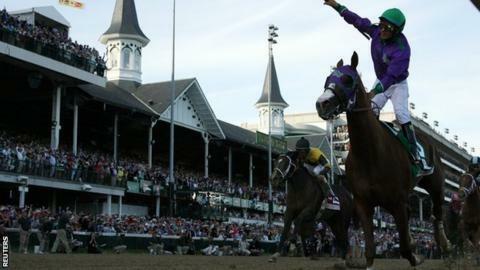 California Chrome won the Kentucky Derby by almost two lengths as 77-year-old Art Sherman became the oldest trainer to win the race. The 5-2 favourite, ridden by Victor Espinoza, pulled away down the straight for a dominant win in the 140th running of the race at Churchill Downs. Commanding Curve, at 37-1, was second, with Danza third in the 19-horse race. "It's been a long haul," said Sherman. "He gave me the biggest thrill I ever had in my life." In front of a crowd of 164,906, the second-largest in Derby history, Espinoza made a decisive move on the chestnut colt, which extended its winning run to five races, after turning for home and quickly sprinted clear in the one-and-a-quarter-mile classic. It was the second Derby victory for Espinoza, who rode War Emblem to victory in 2002. "I thought he rode him perfectly," added Sherman, a former jockey. "I was riding the last 70 yards with Victor, so I think he was riding two. He had a lot of weight on him, I can tell you that." Owners Perry Martin and Steve Coburn bred an $8,000 (£4,750) mare to a $2,500 (£1,480) stallion to produce the winner, whose name was drawn out of a hat, with their one-horse stable. "This is just a dream come true and a great birthday present," said Coburn, who turned 61 on Saturday. "I believe this horse will win the Triple Crown,'' he added. The feat was last achieved in 1978 when Affirmed won the Derby, Preakness and Belmont in a five-week span. Is the Kentucky Derby still decadent and depraved? Read more on Is the Kentucky Derby still decadent and depraved?